Active galaxies have cores that glow brightly, powered by supermassive black holes swallowing stars and other material, and often spit twin jets in opposite directions. In contrast, the Milky Way's center shows little activity. But apparently, according to experts at the Harvard-Smithsonian Center for Astrophysics, it wasn't always so quiet. New evidence of ghostly gamma-ray beams suggests that the Milky Way's central black hole has been much more active in the past. "These faint jets are a ghost or after-image of what existed a million years ago," said Meng Su, an astronomer at the Harvard, and lead author of a new paper in the Astrophysical Journal. "They strengthen the case for an active galactic nucleus in the Milky Way's relatively recent past," he added. 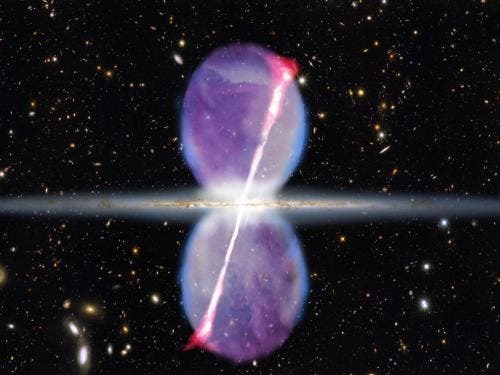 The two beams, or jets, were revealed by NASA's Fermi space telescope. They extend from the galactic center to a distance of 27,000 light-years above and below the galactic plane. They are the first such gamma-ray jets ever found, and the only ones close enough to resolve with Fermi.The newfound jets may be related to mysterious gamma-ray bubbles that Fermi detected in 2010. Those bubbles also stretch 27,000 light-years from the center of the Milky Way. However, where the bubbles are perpendicular to the galactic plane, the gamma-ray jets are tilted at an angle of 15 degrees. This may reflect a tilt of the accretion disk surrounding the supermassive black hole. "The central accretion disk can warp as it spirals in toward the black hole, under the influence of the black hole's spin," explained co-author Douglas Finkbeiner of the CfA. "The magnetic field embedded in the disk therefore accelerates the jet material along the spin axis of the black hole, which may not be aligned with the Milky Way." The two structures also formed differently. The jets were produced when plasma squirted out from the galactic center, following a corkscrew-like magnetic field that kept it tightly focused. The gamma-ray bubbles likely were created by a "wind" of hot matter blowing outward from the black hole's accretion disk. As a result, they are much broader than the narrow jets. Both the jets and bubbles are powered by inverse Compton scattering. In that process, electrons moving near the speed of light collide with low-energy light, such as radio or infrared photons. The collision increases the energy of the photons into the gamma-ray part of the electromagnetic spectrum. The discovery leaves open the question of when the Milky Way was last active. A minimum age can be calculated by dividing the jet's 27,000-light-year length by its approximate speed. However, it may have persisted for much longer. "These jets probably flickered on and off as the supermassive black hole alternately gulped and sipped material," said Finkbeiner. It would take a tremendous influx of matter for the galactic core to fire up again. Finkbeiner estimates that a molecular cloud weighing about 10,000 times as much as the Sun would be required. "Shoving 10,000 suns into the black hole at once would do the trick. Black holes are messy eaters, so some of that material would spew out and power the jets," he said. The image at the top of the page shows an edge-on view of the Milky Way galaxy. Newly discovered gamma-ray jets (pink) extend for 27,000 light-years above and below the galactic plane, and are tilted at an angle of 15 degrees. Previously known gamma-ray bubbles are shown in purple.